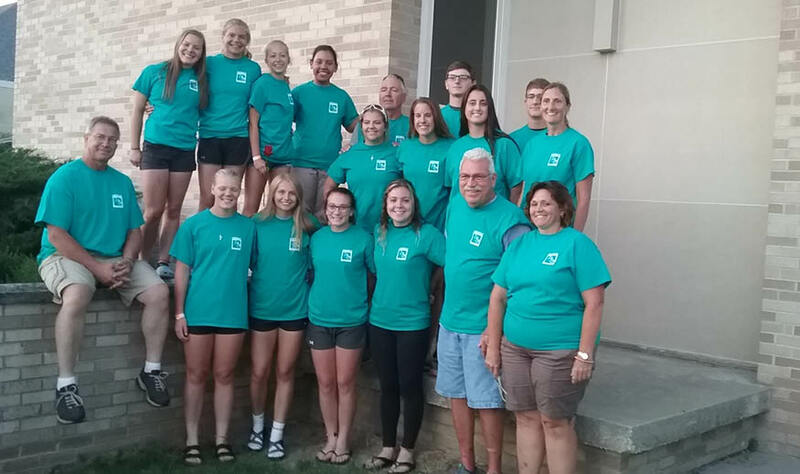 TAMA — After hearing about the tornado that devastated parts of Marshalltown July 19, a youth group from the nearby Circle of Saints Cluster changed plans for their annual service trip to Colorado at the last minute, deciding to go local instead. 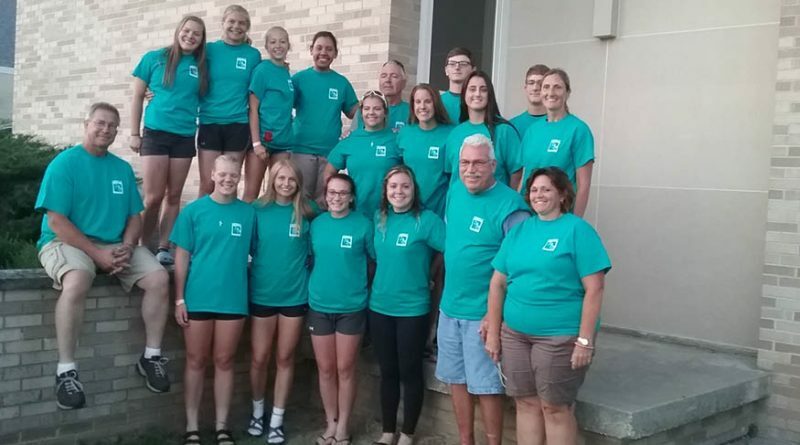 A group of 13 high school aged students and five chaperones from the parishes of St. Michael in Belle Plaine, St. Joseph in Chelsea and St. Patrick in Tama worked in tornado ravaged sections of Marshalltown from July 21-25, living out their faith through performing much needed work, while at the same time having opportunities for spiritual growth. The group brought a skid loader, chainsaws, shovels, brooms and other tools, pitching in wherever they were needed. They cleared glass, branches and other debris at homes and businesses; helped out at St. Mary’s Parish, which sustained damage to a garage; and cleaned up around a veterans’ home. The group formed bonds quickly with each other and city residents. Circle of Saints has sponsored an annual youth service trip to San Luis, Colorado, since 1990. In special circumstances, such as during the aftermath of the Parkersburg tornado of 2008, organizers have shifted plans to accommodate local needs. 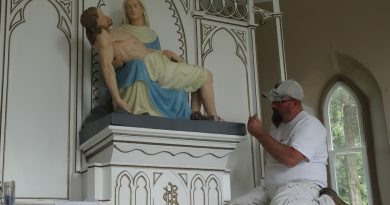 Marshalltown is just a short 20-minute drive from the cluster’s closest parish in Tama, so the group agreed to make the change. Organizers of the service trip program believe the chance to serve those in need is important. 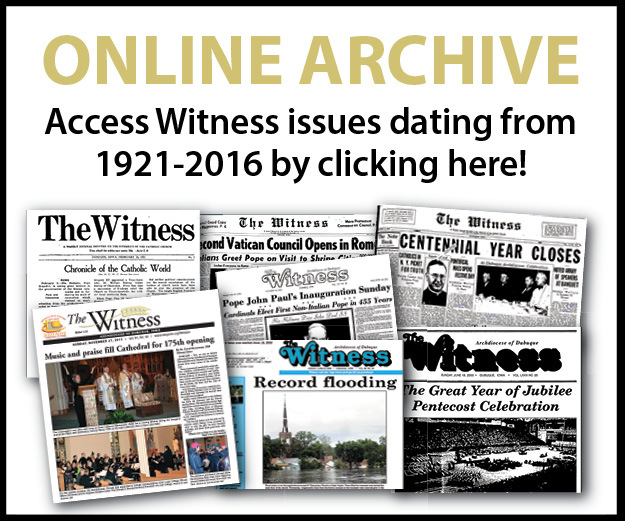 The annual trips include spiritual elements as well as service. In Colorado, the group usually does a Stations of the Cross walk that ends at a statue of Christ on top of a mountain. This year, the group stayed at a camp ground in Montour, Iowa. After work, they would pray and spend time in fellowship in the evenings. The youth visited New Melleray Abbey in Peosta the evening of July 25 where they were able to take part in the monks’ evening prayer. They then did a night time Stations of the Cross devotion, walking up the hill behind St. Donatus Parish in the town of St. Donatus, which is famous for its own Stations of the Cross. On July 26, participants visited St. Raphael Cathedral in Dubuque, culminating with a Mass in the crypt celebrated by Father Andrew Upah. During the days of work, the youth were able to assist in some of the hardest hit areas, including the section of town around Lennox, a manufacturing company that suffered major damages. “I couldn’t believe the amount of damage Lennox incurred; it was unimaginable,” recalled youth group member Patrick Shaull. One of the best parts for the group was seeing how people cooperated in the wake of the destruction, which, thankfully, didn’t include any loss of life. “Everyone has a story; you just need to take the time to listen,” said Gwen Upah. “It was an experience to help people who sustained such damage to their homes,” added Mitch Knock, another youth group member. 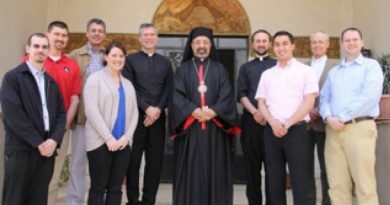 Jackie Toennies, director of religious ed­ucation for the cluster, served as a chaperone. She believes the trip went well, accomplishing its missions of service and of bringing participants closer to God. “The experience of helping those in need and seeing the difference they made in the lives of many was not only rewarding for these young people and the lives they touched, but forever impacted them in a positive and meaningful way,” Toennies said.